Team managers can now create detailed daily schedules for employees on the web and easily add the specific details of shifts to the daily schedules. StaffHub has introduced a new Day view experience, along with the Activities feature to allow users to interact with shift details within the day view. The details can be related to assignments, dispatch information or even scheduled breaks at specified times. This allows managers to take into account which employee is where, doing what and manage the team schedule in an easier manner. For example, Allie Bellew is assigned a shift from 9am-5pm. During that shift, she's supposed to be at the reception desk from 9am-11am, take a lunch break at 11am-12pm, answer phone calls from 12pm-3pm and be the second company location from 3pm-5pm. All these details can now be added to activities within the shift in day view. Scheduling of Activities can only be done through the StaffHub website, where all other shift scheduling is done. Only team Managers can create, update, delete activities. Employees have a read-only view of the day schedule along with activities on StaffHub website. Employees are able to view the activities assigned to them on their mobile phone. Activities are always within a shift. A shift can contain multiple activities. A single shift cannot contain multiple overlapping activities. However, multiple shifts can be assigned to the same user that could overlap with one another. Each Activity has a title, color, optional code (helps in identifying activities on day view), start time, duration and paid/unpaid option. Activities are always scheduled for a certain time period within a shift. The shortest activity duration is 15 minutes. The longest activity duration can be as long as a shift. By default, an activity is always paid, but the Manager has an option to mark it as unpaid. Once an activity is created, it is saved into the system for future ease. Copy-pasting a shift on week or month view, will not copy the activities along with it. By clicking on 'Copy last schedule' on week view, there is an option to copy activities along with the shifts to the upcoming schedule. If you don't want to copy Activities along with the shift, you can deselected the option. Open the Shift & Activities dialog box from any view- day, week or month. Double click on a cell or right-click and select Add/Edit Shift or Add/Edit Activity. Navigate to the Activities tab, and click on Add an Activity. Fill in the details for the activity. ﻿The Save button will remain disabled until there's an activity title added and none of the activities are overlapping with one another. Click Save when you're done to create the activities. At first, all activities need to be created through the Shift & Activities dialog box. Once they are created at least once, they can be added to different shifts in multiple ways. You can navigate to Day view and copy paste activities for that day. You can only copy activities with duration of 30 minutes or more. To create activities of less than 30 minutes, you can use the Activity dialog box. You can navigate to Day view and click the right bar on a cell within a shift. A small menu will pop up, where your most recent activities will be displayed. You can also search for all activities from the search bar in the menu. Navigate to week view, and select Copy last schedule. A dialog box will open up with an option to copy activities along with the shifts to the upcoming schedule. Select the dialog box and copy the activities along with the shifts. Activity details can be modified at any time by following the same steps as above. The full titles of Activities can be viewed by navigating to the Activities tab in the Shift & Activities dialog box, however, the best experience of viewing activities is from Day view, where they can be viewed in the calendar form, with the corresponding activity codes. Activities can also be viewed as a *.pdf form, and can be printed. To do that, navigate to Day view and click on Print to Pdf on top right. This will download a *.pdf file with all the activities within that day. You can view Activities by clicking on a particular shift on the My Shifts page on your phone. 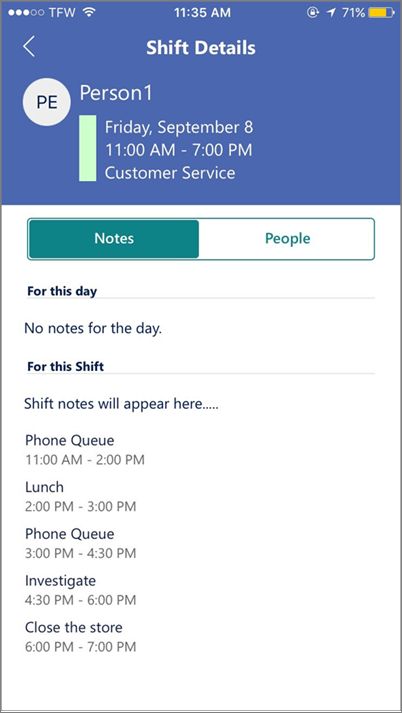 This will open the Shift details page, which contains the day notes, shifts notes and the activities for that shift, along with their specific time and duration. Activities can only be deleted on the web using a browser. This can be done in multiple ways. Delete a shift that contains activities from day, week or month view. Doing this will delete all activities within that shift. Once a shift containing activities is deleted, it can't be restored. Delete activities from Shift & Activities dialog box. Open the dialog box, navigate to the Activities tab and click Delete. Click Undo if you don't want to delete the activity. Once you Save, the deleted activities can't be retrieved. D﻿elete through Day view. Select the activities you want to remove and click Delete. Once the activity is deleted, it can't be restored.